The Liopleurodon (Lie-oh-ploor-oh-don) is one of the Creatures in ARK: Survival Evolved. As it says in the dossier "it mostly hides within the reefs, waiting to ambush prey that swims by." The Liopleurodon swims around until attacked by a player or creature, at which point it will spin around and vanish, never to be seen again. 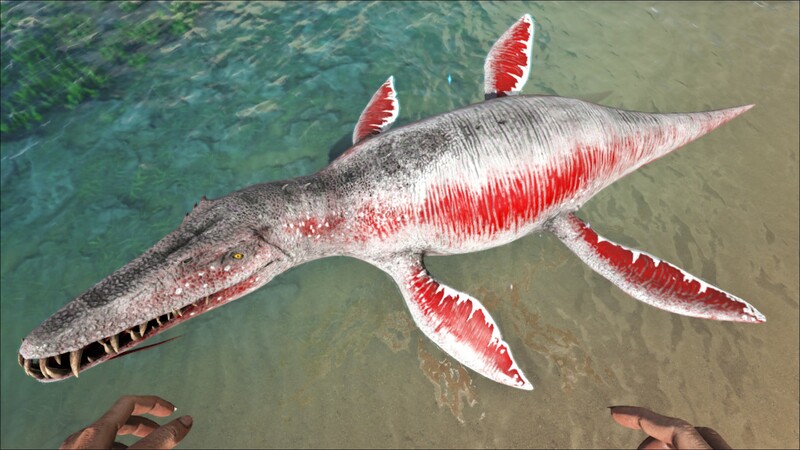 The Liopleurodon appears as a crocodile-like reptile, with two sets of fins and a short tail. It is a pliosaur, a short-necked, large-headed type of Plesiosaur, making it closely related to the deep water Plesiosaurs. It also possesses a single long barbel on its chin to detect the presence of prey swimming past its ambush lair. This section displays the Liopleurodon's natural colors and regions. 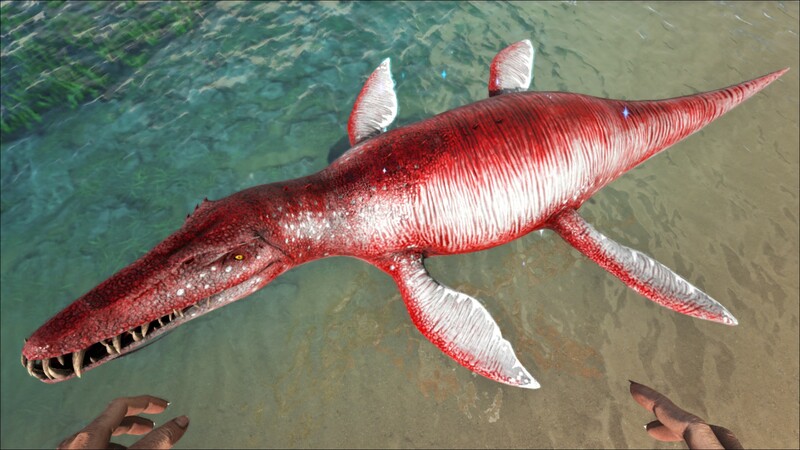 For demonstration, the regions below are colored red over an albino Liopleurodon. The colored squares shown underneath each region's description are the colors that the Liopleurodon will randomly spawn with to provide an overall range of its natural color scheme. Hover your cursor over a color to display its name and ID. For example, "cheat SetTargetDinoColor 0 6" would color the Liopleurodon's "face, sides, and flipper highlights" magenta. The Liopleurodon is a passive tame. It only eats Giant Bee Honey. It is a temporary tame, it will stay tamed for 30 minutes. At the end of the 30 minutes, the Liopleurodon disappears. On The Center the Liopleurodon has been found in the deepest parts of the trench. This section describes how to fight against the Liopleurodon. The Liopleurodon is a passive creature and will not attack you, but will attack you when mounted. As this creature is known for its rarity, it is more than likely the player will only fight a Liopleurodon if startled by a sudden attack when mounted, if not attempting a tame. As this creature can essentially vanish into thin air (or water in this case), no clear strategy can be recommended. You can use anything but as soon as it receives damage the Liopleurodon will teleport away. The Liopleurodon itself doesn't impose any danger if you are not riding a creature; if riding on a creature the Liopleurodon seems to be hostile if you get close but overall its threat level isn't much since it will teleport away when you fight back. However the surrounding water could be inhabited by predators. Low speed and turning radius. It is not meant for battle. Loot Booster: The Liopleurodon gives a "Mystic Skin Oil" buff that increases the rarity and value of any lootbox you open (Deep Sea Loot Crates and Beacons). Crates will briefly sparkle when you approach them to signify their contents have been changed. When you move far away from the Liopleurodon, the buff will persist for five minutes, allowing you to reroll land crates as well. 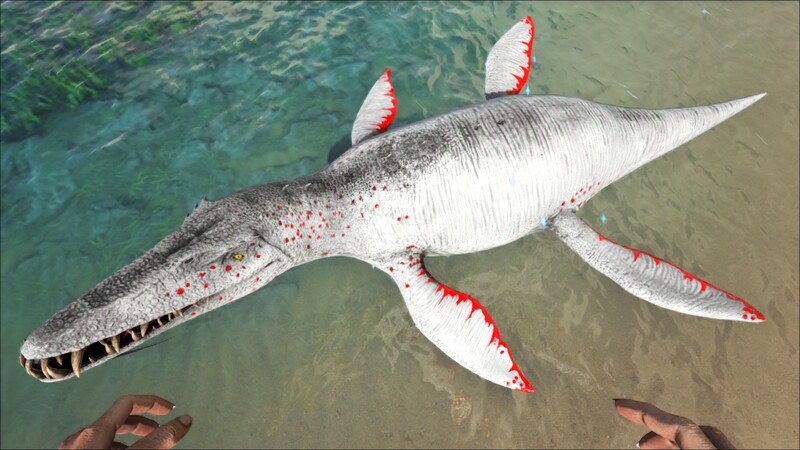 The Liopleurodon will remain tamed for 30 minutes before it disappears. Testing shows that the items will still come from the crate's usual chart. The Liopleurodon is currently one of the least popular tamable creatures in the game. Players have been unhappy with its rarity combined with the fact it is only a temporary tame. Its random luck boosting nature combined with its consumable use makes it comparable to a free to play mechanic in a MMO. If planning to tame one, it is pointless to get attached to them. That said, its hard to deny the call of better loot for any player wishing to find it! The name and elements of the Dossier, such as 'The species on the island almost seem to be magical', Liopleurodon will show you the way' and 'those who don't believe in the Liopleurodons' qualities are shunned' are most likely references to the popular viral video 'Charlie the Unicorn', which features a magical Liopleurodon that guides the way. Liopleurodon means "smooth sided tooth". Currently, Liopleurodon does not give you an oxygen buff, contrary to the dossier. Like Basilosaurus, Liopleurodon is immune to being stunned by Cnidaria, Electrophorus or being caught by Tusoteuthis' tentacles. Can only spawn at level 5 on official servers.